The Rewilding Europe team is looking for a new, passionate, dedicated and experienced colleague to fulfil the position of Wildlife Tourism Manager (maximum 0.8 fte). He/she will be responsible to work with the enterprise team in developing a series of innovative wildlife tourism products in our rewilding areas across Europe. 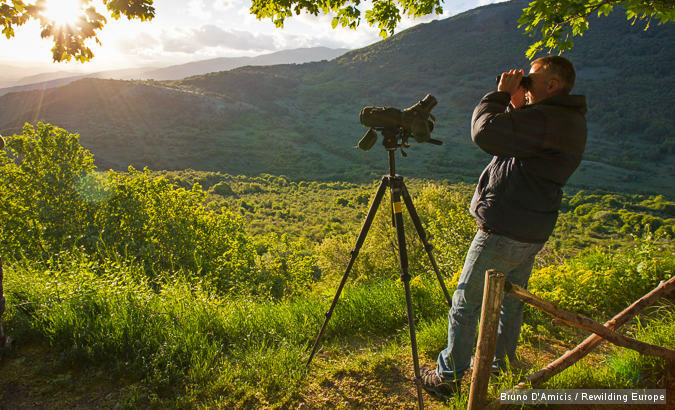 British tourist doing bear watching on a spring evening in Gioia Vecchio area in the Abruzzo National Park, Central Apennines. Abruzzo, Italy. May 2013. Rewilding Europe works to make Europe a wilder place, with much more space for wildlife, wilderness and natural processes; bringing back the variety of life for us all to enjoy, and exploring new ways for people to earn a fair living from the wild. Rewilding Europe has a team of people working from different European countries and currently works with 5 rewilding areas in different locations in Europe. To help develop wildlife tourism products in the rewilding areas, while translating experiences from other parts of the world (e.g. safari-style products, wildlife watching facilities and others) into the local context of the priority rewilding areas within the Rewilding Europe portfolio. The Wildlife Tourism Manager will specifically provide hands-on, practical support to local entrepreneurs, landowners and other wildlife tourism stakeholders who will design, develop and operate the wildlife tourism products. The Wildlife Tourism Manager works very closely with the rewilding & wildlife experts within Rewilding Europe and reports to the Enterprise Director. Starting date: first possible date 1 April 2014. The location from which the Regional Manager will work, is flexible but has to be agreed. Applications should be submitted no later than 7 March 2014 to info@rewildingeurope.com. For further information please contact info@rewildingeurope.com and we will respond swiftly.